Oh yeah, in all of the excitement to show off the Scion's two brothers yesterday, the all-new 2008 Scion xD and the re-styled 2008 Scion xB, everyone forgot about the new-for-2008 Scion brand sales leader, the tC. Well, let's rectify that little problem, because hey — Scion's issued a press release and some PR shots. The tC gets a bit of a newer style including an upper mesh grille, and rear tail lights with a styling that'll make sure you'll be confused as to whether you'll be looking at the front or the back of the bargain-basement budget b-segment car. The tC's still got the "Fun-To-Drive Performance" provided by the 2.4-liter four cylinder VVT engine capable of humming along at 161 hp and with 162 lb-ft of torque. This year's tC, along with it's more flashy brothers, also comes standard with Apple iPod connectivity and a head unit with iPod control. No word on whether the connector cable will provide the head unit information from the iPod via a digital link like Ford's Sync system or if it'll use an analog translation system like that found with GM's PAL system. Oh and it'll also have a standard mini-aux jack in case you've got a Zune or some other form of non-iPod music device. It also comes with a first aid kit in case your ears start to bleed from pumping your music through the Pioneer speakers a wee bit too loud. Gallery below and full press release after the jump. February 8, 2007 - Chicago - The Scion tC, the best-selling vehicle in the Scion lineup, raises the bar in the sports coupe segment as it receives sharp styling revisions, new standard equipment and safety features for 2008. The 2008 tC is distinguished by the new Scion family front fascia, a menacing horizontal combination of headlights and grille. For the tC this includes a new upper mesh grille, lattice lower grille and projector-type low beam headlights with black trim. The tC also receives eye-catching rear tail lights similar in style to the headlights with round combination lamps. Inside, the tC receives a deep orange combination meter on the instrument panel, silver-colored accents on the door assist grips and center cluster, updated seat fabric and Pioneer subwoofer. Azure Pearl and Black Cherry Pearl exterior colors were replaced with Sizzling Crimson Mica and Wave Line Pearl. Apple iPod connectivity is standard across the Scion lineup for 2008. Scion's standard 160-watt maximum output Pioneer AM/FM/CD audio system features a head unit with iPod control. This head unit integrates track, artist and album information from the iPod into a one-line display on the head unit's screen. Connectivity is achieved by simply plugging the iPod into a port via a connector cable, providing outstanding sound quality through the car's stereo system and constant power to the iPod. Music is controlled through the head unit and steering wheel audio controls. A standard mini-jack port also allows users to listen to their portable music collection through the tC's Pioneer speakers. Since many Scion customers add in-car entertainment systems to their vehicle, the tC comes standard with rear head unit outputs allowing for the addition of external amps to boost power to the front and rear speakers, and subwoofers. The tC's optional premium audio system adds one more feature to the standard head unit, the ability to download "skins" to play on the LCD faceplate. Customers can download images, four-second video clips and eight-second movies from Pioneer's website. In addition, Pioneer software allows customers to burn their own images and movies onto a CD and upload them onto the available head unit. Both the standard and premium head units retain key Scion audio system features such as Scion Sound Processing (SSP) where listeners can choose from three pre-set equalizer settings, satellite radio compatibility, a user-customizable welcome screen, MP3 and WMA capability, Automatic Sound Leveling (ASL) and Sound Retouch Technology (SRT), which provides clearer CD sound quality. Both systems will also feature six speakers: two tweeters and speakers in each door panel. Like all 2008 Scions, the tC comes standard with front dual stage airbags, front seat-mounted side airbags, front and rear side curtain airbags, tire pressure monitor system, headrests, three-point seatbelts in all five seating positions and a first aid kit. The tC also features a driver's knee airbag. The tC's roominess and ride comfort can be attributed to its 106.3-inch wheelbase and 69.1-inch wide stance. In addition the tC has four-wheel independent suspension, strut-type front suspension and double-wishbone rear suspension, for responsive handling. A four-wheel disc brake system is standard on the tC. A two-step brake booster increases power assist in proportion to pedal force to provide precise pedal feel. 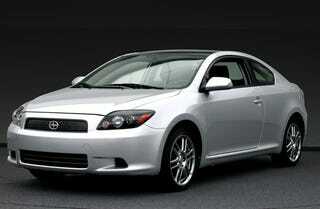 The tC comes equipped with standard anti-lock brakes (ABS) with electronic brake-force distribution (EBD). ABS helps to prevent the wheels from locking during severe braking maneuvers, and EBD monitors differences in front- and rear-wheel speeds and distributes optimal braking force to all four wheels. The tC is powered by a 2.4-liter double overhead-cam four cylinder engine with Variable Valve Timing with intelligence (VVT-i). This CARB-certified Ultra Low Emission Vehicle (ULEV) produces 161 horsepower at 6,000 rpm and 162-lb.ft. of peak torque at 4,000 rpm. The tC features a five-speed manual transmission or an available electronically controlled four-speed automatic transmission. All Scion models come well-equipped in a "mono spec" trim. The tC offers full standard equipment so the customer only needs to choose between manual or automatic transmissions and vehicle color. Standard features include the panorama glass power moonroof (a first in this segment), air conditioning, cruise control, exterior mirrors with integrated turn signal lights, power door locks and mirrors, rear cargo tonneau cover, auto up/down power windows with jam protection, in-key remote keyless entry, rolling-code engine immobilizer security system, auto-off headlamps, electronic hatch release, chrome-plated exhaust tip and a unique audio unit cover. All Scion models come with complimentary factory-recommended maintenance services for the first 5,000 mile and 10,000 mile intervals, to be performed by an authorized Scion or Toyota dealership. The standard tC model is available in a choice of seven colors: Flint Mica, Super White, Black Sand Pearl, Classic Silver Metallic, Sizzling Crimson Mica, Wave Line Pearl and Nautical Blue Metallic. Exterior colors are complemented by a high-quality dark charcoal fabric interior in the standard tC model. Toyota Racing Development (TRD) offers many parts to enhance tC performance, including performance suspension kits, a high-performance clutch, quick shifter, leather-wrapped shift knob and sequential shift light kit. It's easy for customers to take the tC to the next level with Scion Genuine Accessories. Customers can change the tC's look with the approximately 40 available accessories including EMX Super seven-spoke 18-inch alloy wheels with Pirelli PZero Nero P255/40Z R18 all-season tires, polished stainless steel muffler, color-keyed ground effects and a rear lip spoiler. The Optomize accessory program, available at Scion dealers, also offers customers the convenience of cutting-edge, well-known name-brand accessories. For those who really want to express their creativity, Scion also offers the tC Spec Package model aimed at the tuner segment with a lower price point than the standard model. Since wheel changes are so popular in the tuner community, the tC Spec Package model comes standard with steel wheels, P205/55 R16 tires and seven-spoke wheel covers. The tC Spec Package also features a fixed glass panorama roof, unique upholstery, a urethane steering wheel, and a grille and headlight garnish with special treatment. The color pallet for this model includes Super White, Flint Mica, Black Sand Pearl and Classic Silver metallic, compared to the standard model's seven colors. A Scion would not be complete without unexpected utility and content for its class. The tC offers this and more with its unique attention to detail. The tC's comfortable front sport bucket seats feature driver's side height and thigh support adjustments, along with a walk-in function with memory for both the seat and backrest. The push of a convenient lever at the top of the seat back yields a wide step-in space for easy access to the rear seats. The metal-tone center console features a genuine cast-aluminum temperature control dial flanked by soft-touch electronic buttons and an LCD display showing exterior temperature, seven fan speeds and a clock. Shutter-type flush-closing dash vents complement the center console's waterfall design. The dash and upper door panels are covered with unique trim that was inspired by the texture of Japanese paper, while the front-passenger airbag is seamlessly integrated into the dash. Dampers are used for the interior moving parts and ensure smooth operation. The tC's low NVH levels are maintained with extensive use of sound absorption materials. The tC's rear seats deliver utility and comfort. The rear can recline to 45 degrees and can be adjusted into 10 different positions. The 60/40-split rear seats fold forward for a nearly flat cargo floor, and when both are folded flat provide more than 8.5 feet of length for cargo. Standard tie down hooks in the rear seat and cargo areas provided added convenience. Storage is abundant in the tC with four roomy map pockets, bag hooks in side panels, numerous CD, bottle, cup and cell phone holders, and a two-tiered fabric-covered center console. Additional storage can be found under the right rear cargo area for securing valuables. All Scion models are backed by a 36-month/36,000 mile basic new-vehicle limited warranty that applies to all components other than normal wear and maintenance items. Additional 60-month warranties cover the powertrain for 60,000 miles and corrosion with no mileage limitation.